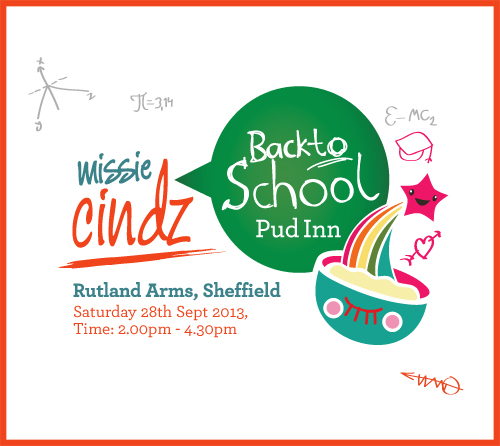 You are invited to attend Missie Cindz’s Sheffield Pud Inn Club on Saturday 28th September held in The Rutland Arms (upstairs) starting 2.00pm – 4.30pm with a special Back to School pudding-themed menu. Five deliciously comforting and sure to bring back memories of traditional school dinners made by our city’s local bakers, chefs, restaurants and Pud Inn diners. What’s on the menu? – it’s a secret until the day of Pud Inn Club! This is a ticketed event and places are limited, Pud Inn tickets are £8 per person and will be available to purchase at the bar from Monday 2nd September or via email booking from 7am. Sorry but I won’t be able to reserve Pud Inn tickets before this date. Please do look out for more event details on this blog, twitter by following the hashtag #MissiesPudInn or by joining and liking our facebook event’s page. Adding to the sweet Detention experience there will also be a Treats Table; where YOU, the diner can bring in homemade with a Back to School theme or shop-bought favourite for us to try and share. I/we all like to try new things and from what I’ve seen, our diners are super adventurous too! If you would like to put your name on our waiting list or to express your interest in future events then please join my colourful mailing list to be kept up to date with my tasteful food adventure or alternatively follow me on twitter and facebook.